One of the downsides to American Express Membership Rewards points is the inability to simply cash them out for a decent value. Sure, you can get a statement credit, but the value is a mere .60 cents per point, which clearly isn’t worth it. You can also get an Amex gift card, but the value is even worse at .50 cents per point. Why would you give up half your points for an Amex gift card? Really, the most lucrative use of Amex MR points is transferring them to loyalty partners, like airlines and hotels. This can yield some tremendous value depending on what you’re able to book. In fact, your points can be worth well more than a penny apiece if you go that route. But not everyone is going somewhere, or wants to go anywhere. So for these people, the Amex Platinum might not be the best credit card out there, especially seeing that it charges an impressive $550 annual fee. Does that mean the Amex Platinum isn’t a good card for those looking to earn cash back? Yes, but there is a twist. If it’s cash back you’re after, simply apply for the Schwab Amex Platinum instead of the regular Amex Platinum. The cards are basically identical to one another, except for one very important detail. The Schwab version of the card allows you cash out your MR points for a great value. And not just a 1:1 value. If you use your MR points for deposits to an eligible Schwab account, you’ll get a value of 1.25 cents per point. In other words, 10,000 MR points is worth $125. That’s a pretty good deal, especially if you manage to get a 100k sign-up bonus. If you do, you’re looking at $1,250 in cash into your Schwab account. I don’t know of too many credit cards that will yield a sign-up bonus worth over $1,000 in straight cash. Of course, you do have to factor in the $550 annual fee, which is quite steep. But if you actually use the associated $200 airline fee credit and the $200 Uber credits, you’ll come out way ahead. For the record, you do need a Schwab account to apply for this version of Amex Platinum. This includes a Schwab One or Schwab General Brokerage Account, or a Schwab Traditional, Roth or Rollover IRA. I actually have a general brokerage account because I wanted to get the Charles Schwab Visa Platinum Debit Card and avoid ATM fees. It required me to open one in order to get the debit card. There aren’t any fees or minimums, and I can avoid ATM fees. So it’s a no-brainer to have an account with them if you frequently use ATMs, or plan to travel abroad and use ATMs. Even if you don’t apply for the Schwab Amex, there’s a good reason to have a Schwab account for the ATM reimbursement. It also means when you’re ready, you can apply for this card. Another plus is that you can earn the sign-up bonus on the Schwab Amex Platinum if you’ve previously earned it on the regular Amex Platinum. It’s technically a different product, so you won’t have to worry about the once per lifetime bonus policy. This is true even if you’ve had the regular Amex Platinum and the business version of Amex Platinum. For those who have made their way through most credit cards out there, this might be a diamond in the rough. And remember, you can also use the points for other redemptions, like travel, gift cards, etc. More importantly, you can convert all your Amex MR points over to Schwab at the 1.25 per cent rate. So if you earned them via other Amex cards, having the Schwab Amex boosts their value instantly. For example, my current MR balance is 3,550, of which most if not all the points came from other American Express cards in my account. If I have 2-3 or more Amex cards earning MR points, I can cash them out (to Schwab) for 1.25 cents apiece, assuming I want cash. It’s similar to how your Ultimate Rewards can be pooled onto a premium card like Ink or Sapphire and then transferred to frequent flyer programs, or simply redeemed at a higher rate via the Chase travel portal. 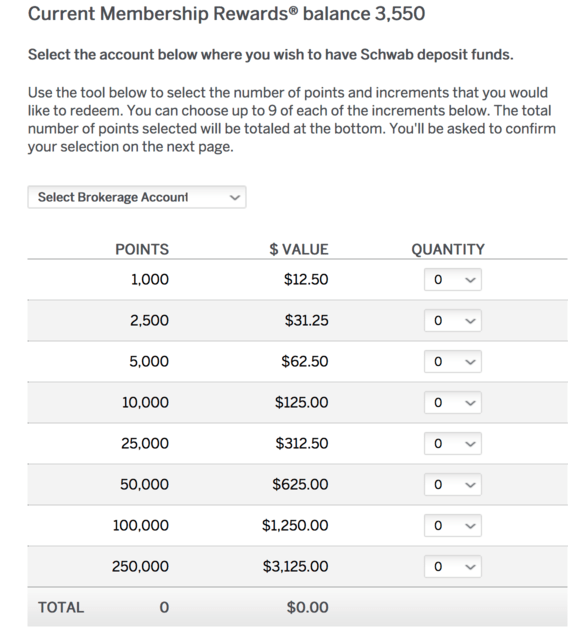 Another plus is that the MR points seem to transfer to Schwab very quickly. 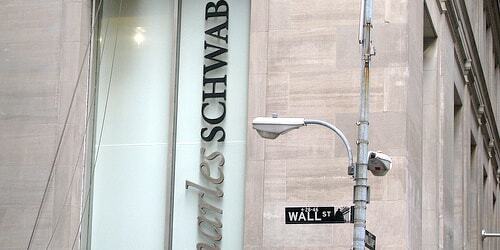 In my experience, you’ll see cash in your Schwab account by the next business day. Currently, the sign-up bonus is 60,000 MR points, which is the same bonus offered on the regular version of Amex Platinum. However, because points are worth 1.25 each when deposited into one of your eligible Schwab accounts, it equates to $750 cash. Looked at another way, it’d be like earning a 75,000-point bonus if you were redeeming for cash. And even more really because you can’t even redeem for cash with the regular version. If you factor in the $5k minimum spend, it’s over $800. For those looking for cash, it’s a great deal and one that is hard to top. And if you happen to have Schwab holdings of $250,000 or more, you’ll get a $100 statement credit upon account approval and every year thereafter. Or $200 if your holdings are $1,000,000+. They refer to this as the Schwab Appreciation Bonus. That’s around $1,000 in cash altogether, and it lowers the effective annual fee to $450 or $350, respectively.